1.That one pretty much looked like most people thought it would - kinda ugly. The Steelers have been ravaged by injuries and started a banged up quarterback adjusting to a shield in rainy weather. The Bengals have likewise been ravaged by injuries, had nothing to play for, and were losers of nine straight. Combine these factors with Pittsburgh weathermen scaring Joe Yinzer with threats of snow, and you can see why over 8,000 failed to show up for the very seats they paid for at Heinz Field. Nonetheless, a loss in the situation would have been a most unwelcome development for Steeler Nation, especially on the verge of a showdown next week with the Jets. This was the definition of the cliched phrase, "Trap Game". And while the Steeler offense failed to produce a touchdown, the defense turned in a suffocating performance, the first time they returned two interceptions for TDs in a game since Dewayne Washington did it against the Jags in 1998. 2. Troy Polamalu quite possibly leapt over James Harrison en route to the NFL Defensive Player of the Year award on Sunday, with two interceptions and a touchdown to his credit. As I'm sure I've said before, the most exciting play in football is Polamalu running with the football, and he proved it again while famously victimizing old roommate Carson Palmer in grand fashion for the second time in his career. 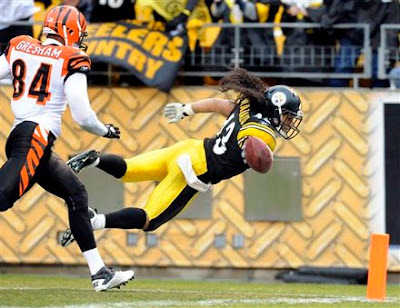 It's hard to believe that Polamalu has only reached the end zone twice in his NFL playing days, but "The Dive" on Sunday and "The Bulldozing of Carson Palmer" in 2004 will both stick out as memorable plays in Steeler history. Polamalu's second pick on Sunday was a tad less memorable, but a rare brain fart allowed #43 to toss the ball behind him and into no-man's land towards the end of the game. Dealing with a bad ankle, the smart play would've been to go down as soon as he had a chance, but Polamalu inexplicably tried to make a move when A. he couldn't run, B. his team was up 16, and C. there were only two minutes left in the game.Thankfully, he was bailed out when Bryant McFadden picked up the loose ball, but let's just be glad Troy didn't hurt himself any more than he already was. 3. The defense obviously won the game for the Steelers on Sunday, scoring 14 of the team's 23 points. But look at some of these other numbers: they held the Bengals to 34 yards on 14 carries; they limited Cincinnati to 190 yards for the game; they generated two turnovers, four tackles for loss, three sacks, and seven passes defended; and they allowed the Bengals to run just 49 plays during the game. That being said, I have no explanation for that 8-play, 69-yard, 5-minute drive Cincinnati executed to score a touchdown on their first possession of the game. Call it the the Blind Bengals finding a nut. 4. The Steeler O had trouble finishing drives on Sunday, but that merely allowed Shaun Suisham three more opportunities to shine in the victory. He's now 9-for-9 since stepping in for Jeff Reed, with all four games resulting in Steeler wins. I continue to be pleasantly surprised, nee, awestruck, at how Suisham's Steeler career has started off. At least to this point, the move to dump Reed was 100% the right one. 5. Ben Roethlisberger put up solid numbers (21-for-33, 258 yards) and did not turn the ball over, but failed to engineer anything tangible on the scoreboard other than leading his team to nine points. I'm sure part of that can be attributed to the absence of Heath Miller, but when you're playing a 2-10 team, the bar is set a little higher. Then again, it's hard to be critical of Roethlisberger on any level playing at less than 100%, especially when considering his record is 7-2 when in the lineup this season. 6. Hines Ward had a nice bounce-back game after a disappointing showing against Baltimore last week, leading some to wonder whether #86 was finally starting to show some signs of decline after all these years. Hines answered those questions with eight catches and 115 yards, leading the team in both categories on Sunday. Mike Wallace was targeted nine times by Roethlisberger and connected on five of them, for 78 yards and a long of 33 - the biggest play from scrimmage in the game. Antwaan Randle-El and Antonio Brown combined for five catches and 46 yards to round out a decent day from the Steeler receivers. 7. Rashard Mendenhall was very quiet, running for 66 yards on 18 carries, with a long of 10. There wasn't much else behind him, as is usually the case when Big Ben is the team's second-leading rusher. The Bengals allow 124 yards a game on the ground, and the Steelers' runners average 120 yards. Once the final second ticked off the clock, the Steelers' total was 123. So this performance was the very definition of the word "average". 8. Around the AFCN, there wasn't much else happening on Sunday. Baltimore is playing on Monday night, so they were probably out causing trouble somewhere. The only other team in action was Cleveland, which fell to Buffalo 13-6 in the Scrappy Bowl. The Browns fumbled five times, and Jake Delhomme threw for 86 yards en route to a passer rating of 49. And the loss officially knocked Cleveland out of the postseason picture. At least they have the Indians to look forward to, with Cliff Lee and CC Sabathia and Manny Ramirez. 9. Next week, the Steelers host the Jets at 4:15 on Sunday, so we can look forward to a week of dumb Rex Ryan quotes, the Santonio Holmes/Darrelle Revis/Matt Cavanaugh-return-home storylines, and talk about how the Jets' struggling offense (no TDs in the last two games) will fare against the Steelers' vaunted defense. Does that about cover it? As for the rest of the division, Cleveland travels to Cincinnati for the Ohio Class A State Championship, while Baltimore hosts the New Orleans Saints, hopefully while sporting a two-game losing streak in the aftermath of Monday Night football. 10. Finally, it's Sad Trombone time! As you know, the Sad Trombone goes to someone who deserves no sympathy and in turn gets mocked by internet tough guys such as myself. This week's recipient is a man who's garnered ample praise during his NFL career, while accomplishing nowhere near a level that would necessitate such gushing. On Sunday, he once again led his team into self-destruction by throwing two pick-sixes that single-handedly sunk his squad. He's overseen a 10-game losing streak. and has thrown 10 interceptions in his last five games. Fantasy nerds have always loved him, but I have always...always....led the charge in the opposite direction. Ladies and gentleman, blow your Sad Trombone for Mr. Carson Palmer. "I have no explanation for that 8-play, 69-yard, 5-minute drive Cincinnati executed to score a touchdown on their first possession of the game"
Hard to be too critical of Ben when every time they enter the red zone the line either commits a holding penalty or allows multiple free blizters. The offense needs to get out of its own way. It's just a relief to put a game like this behind us and move on. It was the definition of a trap game, but we stepped up and made plays when we needed to. Once again, holding penalties KILLEED us. Interesting that they don't appear to go both ways. I am probably imagining that though. Hopefully Heath is back next weekened. Our RZ TD efficiency has been off all year and that's the same story from last year as well. I remember commenting on here when Arians was retained that the RZ TD% was by main reason for opposing him as OC. It really hasn't improved at all. But Troy's had 4 TDs I can remember offhand. The one against Palmer yesterday, and the other one earlier in his career against Palmer where he was spinning and turning all the way to the end zone. I recall him recovering a Bret Favre fumble in Green Bay and taking it to the house a few years ago. And the pick-6 of Joe Flacco in the AFCC a few years back. Lou, you are correct on all fronts. That was only his second regular season pick-6. I remember reading the ESPN article that mentioned this was only his second defensive TD and knowing that was incorrect. This offensive line is being held together mostly with bubble gum and duct tape, by now. Anyone think there might be a chance they look for a free agent come playoffs that could help out the o-line? Another underachieving performance by the offense. When is the OC going to be held responsible? Arians is going to end up costing this team. 4 years of mediocrity with some of the best offensive talent in the league is inexcusable. One thing is clear: Hines Ward reads Mondesi's House comments. I was pumped to see him making big plays yesterday. I hope this is a second wind for him this season. We will need him in the playoff run! They still won even without the defensive touchdowns. This team has shown me that they could easily show up at Heinz Field and put 21 points on the board. It's so inconsistent. 2. Has Troy won a Defensive Player of the Year Award? He's had a lot of great great seasons, but i can't remember him getting recognized as the best before... am i wrong? 3. "I have no explanation for that 8-play, 69-yard, 5-minute drive Cincinnati executed to score a touchdown on their first possession of the game" -as Corey said, a key penalty on 3rd&2 continued the drive, then a pass interference in the end zone make up most of those 69 yds/1st down conversions. Seemed like the stillers D made adjustments and the bungals O did not. 4. Gush over Suisham all you want (he has been pleasantly good), but know that Skippy is 7-7 on FGs for the 9ers. As far as kickers go, one big miss at any time could drastically alter everyone's perceptions of them. I never thought Palmer was anything special but he would have skyrocketed to the top of my best QB list if he would have simply b1tch-slapped that whiny TO on the sideline. Troy has not won defensive POY, but he's definitely making his case this year. I'd say he and Hulk Ho--....I mean Clay Matthews are on top of the leader board right now. Somewhere Peter King has moved on from beating Carson Palmer's drum to someone else's equally as worthy of unearned praise. Is anyone else concerned about our offense's ability to score? Next week could be a very defensive contest with the Jets. It will be interesting to see how Tone does. Nice play by Randel El; almost made me feel bad he had been demoted...nah! I actually read that the Bengals should trade Carson at the end of the season. Mr All World? I mean why..he has done so much. @ Nuke - Mark Sanchez seems to be next in line for 'unearned praise'. Skippy Reed has been 7-for-7 as a Niner, but those came in a dome (Zona) and in two cold, but clear games (Green Bay, SF). Also, only two of those kicks were 40+ yards (44, 44). Suisham, on the other hand, is 9-for-9 with six 40+ yarders (41, 41, 45, 45, 46, 48). He's also had to kick on a cold windy night in Baltimore, on a windy, wet day in Buffalo, and on an ugly day on the same surface that doomed Reed earlier this year in Heinz. Plus, if Reed had tried to catch those long snaps like Suisham did as a punter last week, they'd just bounce of his gut and roll back to the line of scrimmage. It's hard for me to imagine a game where Dewayne Washington did anything other than get torched deep on numerous occasions, although I'm sure that happened once or twice in that 1998 game as well. Also, am I the only one that literally holds his breath after every decent offensive play, praying that I don't see a yellow hankey which I KNOW will be a holding call? @Justin, You are not alone in that respect. Any time we get more than a 5-yard run, I look for the Laundry. It's like when you are playing NCAA or Madden on PS2 and it's one of those " No Effing Way It's Gonna Let You Win Games". I was playing last night and ran a perfect play fake and roll on a 4th and inches after losing a challenge when the ball was actually spotted BEYOND the first down marker. I hit my #1 WR wide open in the flat and he drops it. Nobody around, just dropped it. Corso then noted I was stupid for not punting! I know that's a long winded explanation, but that is how I feel when we get a big play. Instead of the AI dropping the ball for you, you get a phantom penalty that you KNOW wouldn't/doesn't get called on the other team. But we still won the games, and that is the best measure of this team's will and desire. "Also, am I the only one that literally holds his breath after every decent offensive play, praying that I don't see a yellow hankey which I KNOW will be a holding call?" This is the story on just about every big play in the NFL. What is the first thing the tv guy says when a guy breaks into the open field or catches a deep ball? "NO FLAGS DOWN!"